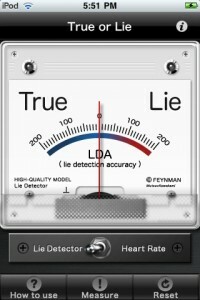 Quick Look: True or Lie by iPhonez Co. 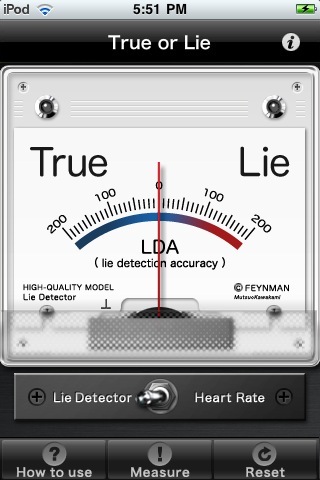 True or Lie by iPhonez Co., Ltd. is an app that helps you determine whether someone is lying or telling the truth. To start out, you need t0 push the button marked “measure”. Then hold the microphone up to your subjects neck to check their pulse. Now the interr0gation begins. Once the heart rate is set, go ahead and start asking questions to the person. If they are lying, the needle should go towards the red zone and if they are not then it should stay in the blue zone (your mileage will vary). 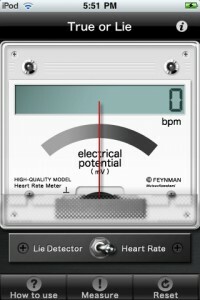 If you don’t need the lie detector, but you need a heart rate monitor, simply flip the switch and put the mic up to your neck and wait. True or lie is accurate only about 60% of the time for heart rate monitoring and even less at lie detection. However, the graphics on this app are pretty good and they look just like a real lie detector would. 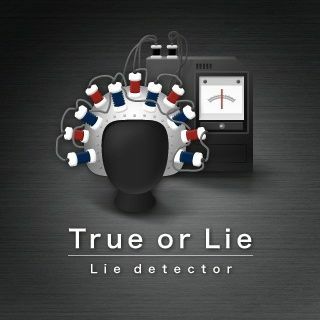 If you’re looking for a gimic to use on your friends or significant other then look no further however, if you’re looking for FBI quality lie detection then keep looking. True or Lie is $.99 in the iTunes App Store.